One of the major advantages of staying in an official Cedar Point hotel is the privilege of early entry. The park opens two or three of its star attractions exclusively for hotel guests who are prepared to get out of bed at an ungodly hour. 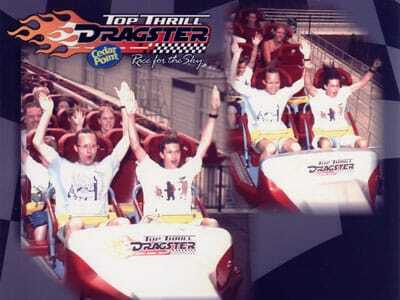 We'd been advised by hotel staff that the attractions operating today were Millennium Force and Mantis, but late technical issues meant the latter ended up being replaced with Top Thrill Dragster. This ride was our chief motivation for visiting Cedar Point, but in a rare display of self control we elected not to join the queue. Instead, we made our way across to Millennium Force, figuring that not very many people would make this choice. This decision proved to be inspired; we were able to get two separate front seat rides while waiting less than twenty minutes each time, and we could easily have gone round eight or ten times had we been willing to sit anywhere. There are many different ways to wake up in the morning, and this has to be one of the better ones. With minutes to go before the park opened we headed back to Top Thrill Dragster (#203) in order to enter the queue before the multitudes. One inevitable ride breakdown left us a total wait of just over two hours for a front seat, which only goes to show how bad the queues for this ride can get. To paraphrase a line from park advertising, many coasters are dynamic and thrilling, but this ride frankly wasn't one of them. Perhaps the wait had left me a little on the grumpy side, but to be honest, the experience of Top Thrill Dragster disappointed me. There is no doubt that the top speed of the ride, the height, and the view from the top are all second to none. However, the feeling of acceleration was distinctly lacklustre in comparison to my launch last week on Hypersonic XLC. Amazingly we'd gotten in just four rides before lunch time, one of the joys of visiting a park like this one in August. Allowing some time for digestion seemed like a good idea. James and Andrew played a few games of Dance Dance Revolution while I tried out some of the classic arcade games. Cedar Point has a decent selection in this regard; I played games of Frogger, Ms. Pac Man, Sega Monaco GP, Centipede, and Asteroids Deluxe. It was also nice to finally see some real electro-mechanical pinball tables; I'm simply not old enough to have caught them when they were the leading edge of technology! The rest of the afternoon was spent moving around various other coasters, almost all of which had no wait to speak of. Raptor was running well, as was my favourite ride at the park, Wicked Twister. Two laps on Disaster Transport, one lap on Corkscrew, and finally a back seat on Millennium Force finished up the day. Curiously enough the pop of air time on the first drop that one might expect from a back seat ride was largely absent here. It was still a great ride, but for me this is definitely a front seat coaster.